Hi! I am Clarissa and I am a two-time acute lymphoblastic leukemia (ALL) survivor!! I am now 23 years old and a graduate of Duke University. My passion is helping others cope with the ups and downs of life as a cancer patient or survivor. It is my goal to become a clinical psychologist and help adolescents and young adults with serious illnesses cope with the social and emotional challenges presented by their illnesses. I currently live in Sydney, Australia, with my fiancé, Eren, and I work as a research assistant with the Behavioural Sciences Unit, proudly supported by the Kids with Cancer Foundation, in the Kids Cancer Centre, at Sydney Children's Hospital. The BSU runs a wide range of projects that aim to address the psychosocial challenges faced by childhood, adolescent, and young adult cancer patients and survivors, as well as their family members. Aside from my work experience, I have volunteered as a Patient Ambassador for Johns Hopkins Pediatric Oncology. Through that, I have spoken at fundraising events for Johns Hopkins Pediatric Oncology and foundations they have partnered with. At Duke University, I was involved in Blue Devils vs. Cancer, a student organization dedicated to fundraising for the Duke Cancer Institute and supporting the patients being treated there. I was Vice-President of the group my sophomore year and greatly enjoyed taking on a leadership role in order to help BDVC reach more patients going through treatment and more organizations who are helping them along the way. I served as the Director of Community Service for my sorority, Chi Omega, as well. I also previously volunteered at Camp Sunrise, a one week camp, in August, for childhood cancer patients and survivors. The camp is sponsored by Johns Hopkins Hospital and is truly incredible. When I was diagnosed with cancer for the first time at 2 years old, I was treated at St. Christopher's Hospital for Children and then at CHOP - the Children's Hospital of Philadelphia, because my family lived in Pennsylvania at the time. I did great after completing that first treatment and went back to living a normal life. Then, days before my 13th birthday (about 10 years after my initial diagnosis), my leukemia relapsed unexpectedly. So, I went through another 2 1/2 years of chemotherapy. This time I was treated at Johns Hopkins Hospital, in Baltimore, because my family had moved to Maryland. During my second treatment, I was very immunosuppressed. Therefore, I could not be in school through 8th, 9th, and half of 10th grade. Instead, I had a home-teacher to help me keep up with my classes. I know that, during those 2 1/2 years, I longed for a friend each and every step of the way, a friend who was a teenager with cancer like me. I wished I knew someone dealing with the same challenges I was dealing with. I wished for someone who was one step ahead of me. I needed that person there, telling me I was not alone, that my emotions were normal, and that there were ways I could cope with everything I was feeling and all of the things I was going through. There was no such person there for guidance, no one with which to commiserate. There was not even a book out there for guidance. 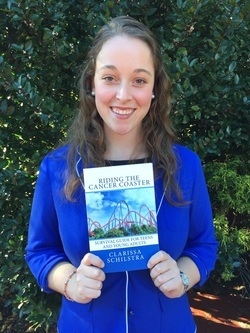 When I realized the importance of such a guide, such a book that could provide hope, support, and friendship to teens and young adults with cancer, I decided to make it my mission to create that book. So, here I am. This website was one of my first steps towards writing my book and reaching out to other teens and young adults with cancer. You can find the book through the "The Book" tab above or you can look for it through Amazon's website. While I am so happy to have been able to write and publish my book, I love writing this blog and hope to continue to do so for years to come. Cancer is a twisting, turning, and terrifying emotional roller coaster. However, I hope to provide inspiration, support, and positive power to those who find themselves shaken by the devastation of a diagnosis of cancer. Follow me on Twitter @CESchilstra for blog updates and notifications of interesting AYA oncology information! If you have any questions, or just want to say hi, contact me! Please double check your email address is typed correctly so that I can reply to you!